This morning I awoke too early to the sound of a text message from work. But that problem was quickly solved, and I settled down to a nice nap on the couch. Nancy and I visited 5th & Elm in Houghton for lunch. 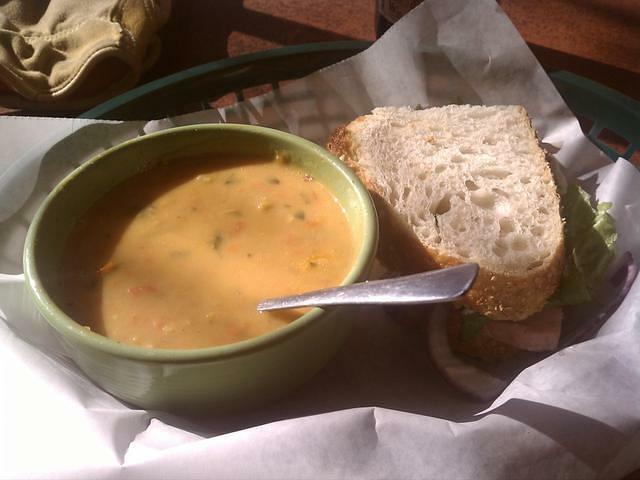 I had half a turkey and havarti sandwich, and some delicious coconut curry soup. We poked around downtown Houghton for a while, and I got some mandolin advice from Good Times Music. Since it was such a nice day, we headed out to McLain Park. It wasn't particularly warm, but the sun felt so good. I just added the weather icons back to the right column of this here weblog. I'd forgotten about them after the switch to Serendipity, so if you were depending on this blog for up-to-the-five-minutes-ago weather in a tiny, imaged-based format, well, sorry. But what's neater than little weather icons? How about graphs! Here at work, we're well into year two of no A/C in the building. Last year, there was a lot of speculation about how hot it actually was down here, so this year I set up a 1-Wire temperature sensor and pointed temploggerd at it. Hoo. It's 89 degrees at the moment. See Nancy Run. Run Nancy Run. 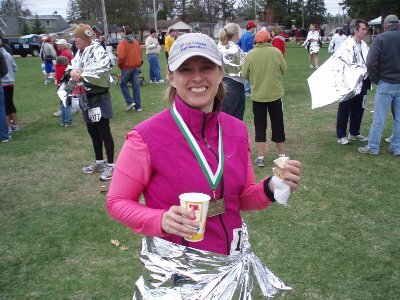 On Saturday, Nancy ran the 2009 Journeys Half Marathon in 2:19:12, continuing her streak of ever-better times. 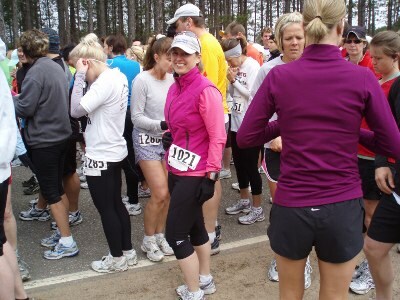 It was a cold and windy day in Eagle River, but it was still fun to be at the race, and to celebrate afterwards. Nancy at the start, smiling despite a few flakes of snow. I navigate a back road to my spectating point about 4.5 miles in. At the finish, free food in hand, moments before a quick dash to the hot tub. Today, Nancy, James, JP, and Danielle, and I went skiing at Swedetown Trails. I skied classic style along with James (my mentor), while the rest skied skate style. It was a lot of fun, but a heck of a workout, which I need anyway. Phew. I'll definitely be back after I recover. Yay winter sports. Oh, and James fell more times than I did, and he's the expert-looking guy in tights. Ha. Last week, Nancy and I stayed at High Cliff State Park, in Sherwood, Wisconsin. It's the site of an old limestone quarry and processing company, the Western Lime and Cement Company. This was once the site of a thriving lime producing business known as the Western Lime and Cement Company. From beginning to end, production here lasted approximately 100 years (1856-1956). All that remains today are the skeletons of the three kilns in front of you. Niagra Dolostone (limestone) quarried on top of the ledge was maneuvered down treacherous, zigzag trails by horse drawn carts. A pulley system later replaced the horses and made for more efficient transportation. The rock was dropped into the tops of the kilns and after "baking", was drawn out as a powder from the arched doors at the bottom. The kilns were heated to a temperature of around 2,200 degrees Fahrenheit to turn out a white powdery substance known as "quick lime". Heaps of waste lime are still present on the hill behind you. Wood fueled the kilns until the supply of trees on the ledge was depleted. Coal was later used. Quick lime was barreled and bagged in the Cooper's Shop, the brick structure located to your right. Product was then loaded onto barges and railcars for shipment across Wisconsin. Good quality lime was used in plaster, cement, and for agricultural purposes. Poorer quality rock was sent to the crusher bin to be made into gravel. If you travel east along the Lime Kiln Trail, you can still see the remains of the foundation for the gyrating crusher. No rides for Thursday or Friday, since my bike's been in the shop (a broken spoke on the rear, new tires, and both wheels trued). I didn't ride this morning, since Dad and I left early to cheer on James in the Copperman Triathlon 2007 in Copper Harbor. After the triathlon and lunch, we hiked out to Hunter's Point. James pointed out that Google now has high-resolution (20-m) imagery of the Huron Mountain Club. It's never too early to plan our second attempt to infiltrate the Huron Mountain Club. Now I need to find the GPS track from our last trip and update our maps. Further bulletins as events warrant.